Are you seeking media attention? Have you sent out media releases to promote your company, product, service, issue, or event? Are you attempting to use the media to reach potential customers, shareholders, sponsors, donors, or other stakeholders? Is there an issue in your sector or at your company that has, or might, capture public attention? Are you dealing with a problem or a crisis? Are you using social media, such as Facebook, LinkedIn, Twitter or a blog? Do you want to know what your target audience is saying about you on various social media streams? In short, "Are You Ready For Your Interview?" If you answered yes to any of the above questions, you need to be prepared for interviews by reporters, broadcasters, or even bloggers. And need to know how to reach your target audience using social media or to handle social media issues that may arise. How To Prepare For Media Interviews will show you how to get ready to face the media -- how to answer simple or confrontational questions and how to handle a crisis. In addition, this special report includes two sections on using social media to convey your message and monitor (and respond to) what others might be saying about your company or organization. 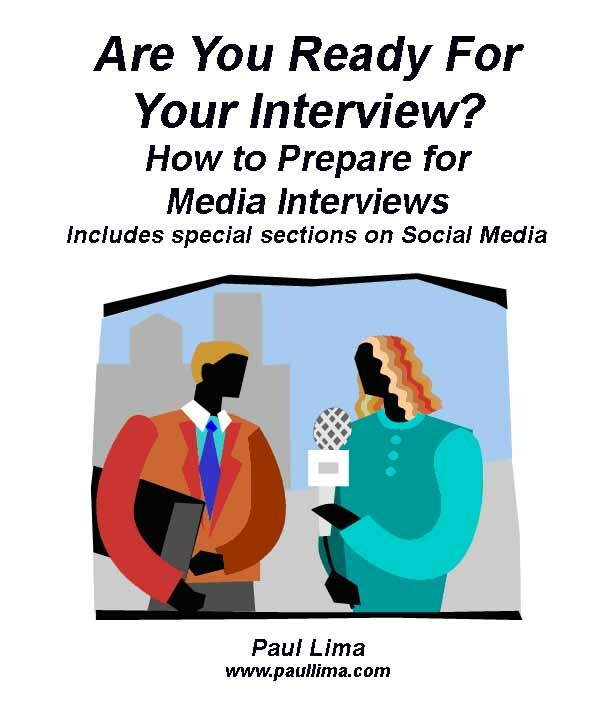 The special report is divided into five important sections: how to prepare for media interviews, which includes preparation for soft, difficult, and confrontational questions and crisis management; tips for interview success; orientation for doing TV interviews; social media (Facebook, LinkedIn, Twitter, and others); and blogging. The report includes sample scenarios, sample questions questions and a variety of answers -- including typical answers that the unprepared interviewee might give and powerful answers that a prepared interviewee would give. with a new prospect until they have agreed to go through Paul's training. And all of our clients have been extremely happy with the training." - Alan McLaren, Infinity Communications Inc.
consultant and a media interview trainer since 1990. "Paul’s insights and honesty helped me become completely comfortable in front of a camera or radio microphone… and it all occurred in one session. If you want real life media training results, Paul is your man."